Finer geometries and thinner copper can present a challenge for fabricators measuring impedance on leading edge PCBs. The CITS880s answers that challenge with the introduction of Launch Point Extrapolation (LPE). LPE extrapolates the TDR response back to a point close to the start of the transmission line effectively allowing to users more accurately to measure the instantaneous or incident impedance of the line. CITS880s supports groundless differential test with Polar's unique groundless differential probes which enable on board test where access to ground points can be a challenge. Groundless differential probes for the CITS feature a single coaxial connection and are easy to handle for operators and have lower ownership costs than traditional differential probes. The CITS880s is the ninth generation of Impedance test system from Polar and is a development of the CITS880 which is in widespread use across the industry. In addition to LPE the CITS880s is able to test shorter traces – typically 2 to 3 inches shorter than previous generations of CITS. CITS880s also ships with completely re-engineered IPS high speed probes which reassuringly are precision molded with ESD dissipative materials to give maximum protection for your CITS. Controlled impedance PCBs are used across a broad range of applications to help ensure high frequency signal integrity. Designers invariably specify these types of PCBs whenever the edge speeds of digital signals are faster than 1ns or analog signals climb above 300MHz. The characteristic impedance of a PCB trace is determined by the dimensions of the trace and the properties of the PCB material which can vary from batch to batch. To control trace impedance PCB manufacturers usually vary trace width to compensate for different batches of PCB material. Historically, they were then forced to use specialist laboratory equipment such as a time domain reflectometer (TDR) to measure the characteristics of a representative trace etched on the board or a test coupon. This approach was complex, expensive and far from ideal in a production environment. Polar produces a comprehensive range of test probes, including the IPDS-100 differential model shown here. 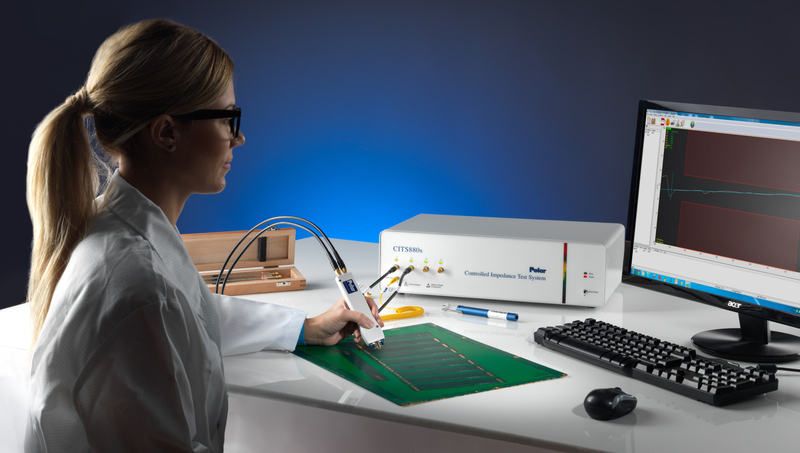 The IPDS probe family is designed especially for use with the CITS880s and combine revised internals with more robust mechanical design and enhancements to the signal path, along with ergonomic precision moldings in 100% ESD dissipative materials. IPS and IPDS probes are easily identified and contrast with previous generation probes by the use of blue labels and blue resist on the probe tip interface. You can minimize your IPS probe costs to by ensuring your coupons are designed with a "preferred" footprint please ask your local Polar office for advice on coupon and testpad geometry. 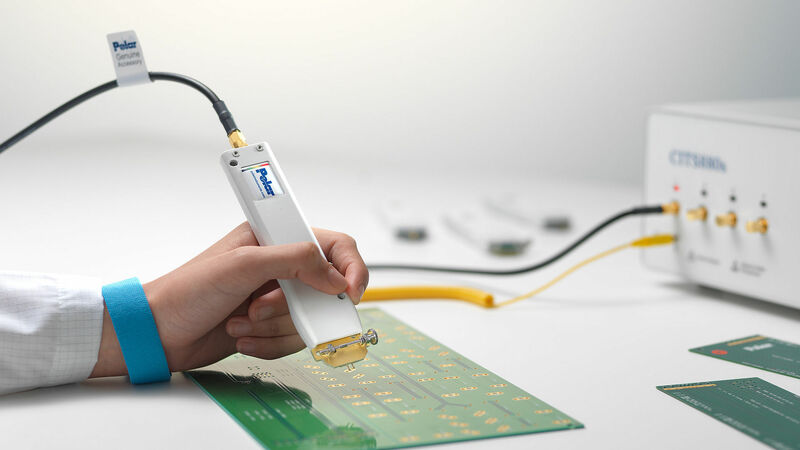 Groundless probes are available for 2015 editions of the CITS880s and onwards, both fixed pitch and precision variable pitch groundless probes are available for situations where OEMs mandate on board test of differential pairs - and where the ground connection on the PCB is either difficult to access or completely inaccesible. Polar's optional CGen Coupon Generator enables you to design your test coupons using a range of styles and probe foot prints. CITS impedance test systems are exceptionally easy to use. Powerful Windows-based software automates every aspect of testing, enabling the entire process to be controlled by a single click of a mouse or footswitch. You simply position the IPS probes, select a test file containing the normal PCB test impedance and tolerance, and press the footswitch. There is no requirement to perform any of the adjustments that are conventionally associated with complex TDR measurements such as setting-up vertical gains, pulse time delays and timebase values. 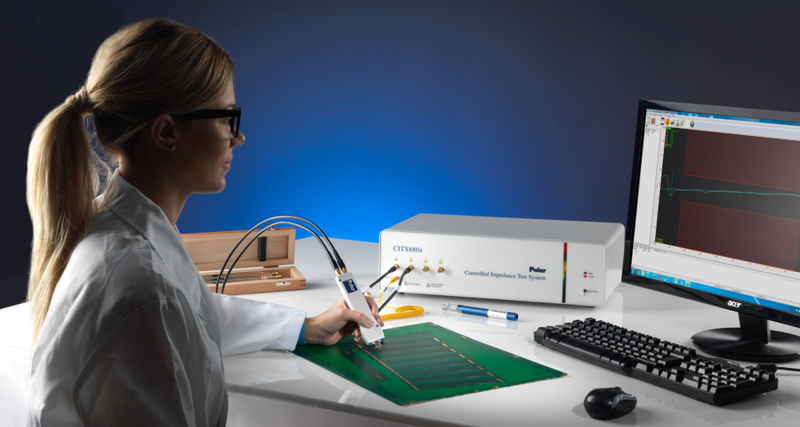 For maximum throughput, the CITS can execute a series of impedance tests automatically, prompting you to reposition the probes as appropriate. Test results are simple to understand – the CITS automatically processes the data to produce an unambiguous display of characteristic impedance vs distance, and provides clear visual indication of pass/fail status. On fine geometry boards which sometimes exhibit an upward sloping trace, the use of Launch Point Extrapolation (with the approval of the board design authority) will allow you to better correlate the impedance test resutls with 2d field solver (such as the Si8000m) predictions. Use of LPE also makes the measurement far less subjective to the positioning of the test limits. All CITS880s now also offer direct export of test results in Excel compatible format. You can print test results to provide conformance reports for your customers, store the data on disk for archive purposes or future analysis or export it for real-time SPC purposes. An optional datalog report generator (DRG) accommodates a wide variety of standard forms, for simplicity of reporting. A barcode reader is also available as an option, which enables PCB identification labels to be scanned-in during the test process, reducing handling time and eliminating error. Speedstack layer stackup software can now directly export CITS880s test programs from a controlled impedance stackup. CITS880s Assure Annual Subscription is a new way to deploy CITS with assurance of service continuity from a maintained CITS880s for a low initial outlay at a fixed annual cost. Sensitive electronic test equipment like the Polar Controlled Impedance Test Systems can prove vulnerable to damage from static electricity if proper anti-static procedures are not followed. Application Note AP8500 note looks at the best ways to prevent the build up of static charge in the work area – and avoid expensive repairs to your CITS. Trade in your CITS100 / 200 / 500 /900 for a new CITS880s The CITS880s includes batch conversion utilities to speed file importation and conversion from legacy CITS systems.